Mal has been at it again and released the second volume of his convoy series. The first volume was released through Clash of Arms however as a result of differences in opinion between the author and publisher, Mal has gone ahead and released the second volume himself as a printable PDF. 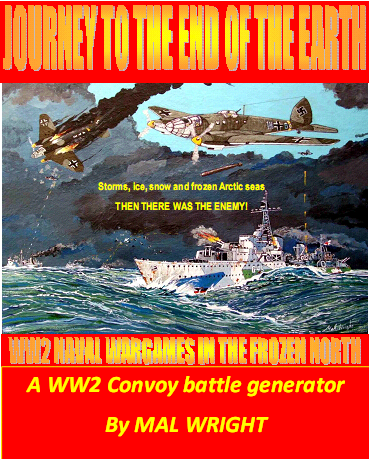 This volume covers the amazing Arctic Convoys to Murmansk. Mal had used the working title of Arctic Storm for this volume. The publication is 66 pages long and contains the rules needed to generate convoys, determine the outcome of actions that arise as he convoy sails to its destination and then to resolve those actions. One of the big plusses with these rules is that the detail is provided in a generic enough form to enable the player to resolve combat using whatever his preferred set of naval wargame rules are. I must admit that I have been a play tester on Mal’s Convoy rules and I do like them a lot – they are one of the most original pieces of work I have come across in many years. I will give these a close read over the weekend and post a more complete review next week. “A JOURNEY TO THE END OF THE EARTH”. $25.00 Australian for the PDF download. On receipt of the PayPal notification I will give details of where it can be downloaded. Note that the ship logs are now on the WW2convoy site as free downloads. The web address for the ship log downloads mentioned by Mal is: http://groups.yahoo.com/group/WW2convoy/. You will need to register on that website but support for the rules is made through there. Previous Article Sometimes the Old Ways Worked!